As many of you are aware, we bought our first ‘OUR’ home in August. Even as it was being built, my head was going crazy with a million ideas of what I would add, how I would make it unique and our own, things to make it work best for our family. 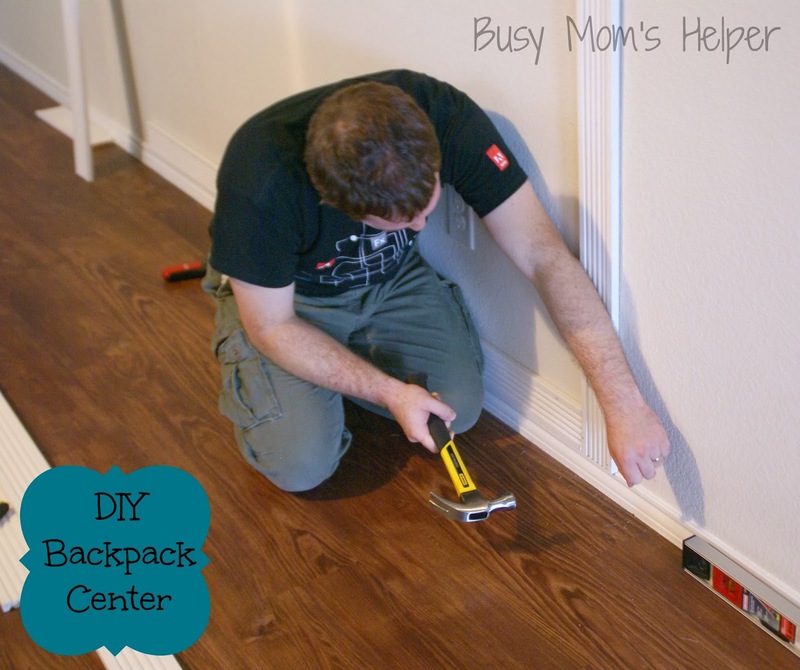 My First New Home Remodel Project: DIY Backpack Center. Ya, not exactly the prettiest spot – but oh the potential!!! So the brainstorming, measuring, Pinterest-surfin’, measuring and sketching drafts (plus more measuring) began. And continued….seriously, like a little notebook later and I finally had the plans/measurements I wanted. Then it was off to Home Depot! Shelf: a REALLY long board, plus two support ends. Biggest piece of advice = Measure, measure measure!!! Every little thing, measure it! Step 1: Paint the frames, if necessary. If you’d like, paint your boards now, too. I was set on having black frames, but fell in love with the design of these light blue ones, so I painted them black myself. 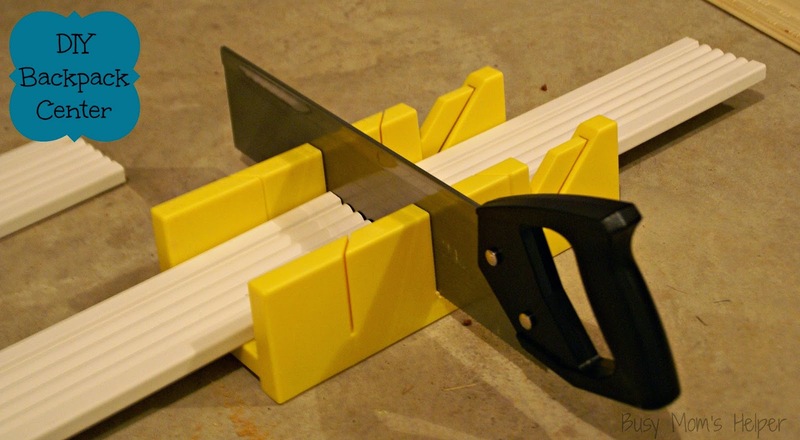 Step 2: Cut your boards. See ‘Notes 3’ below. I don’t have a nice wood saw, but I bought this little saw/guide pack for less than $15 and it did a wonderful job! Steps 3 – 5: Put on the bottom board. Then the two side boards. Then the top board. YES – in that order! Again, MEASURE so you know this spot is really where you want it! 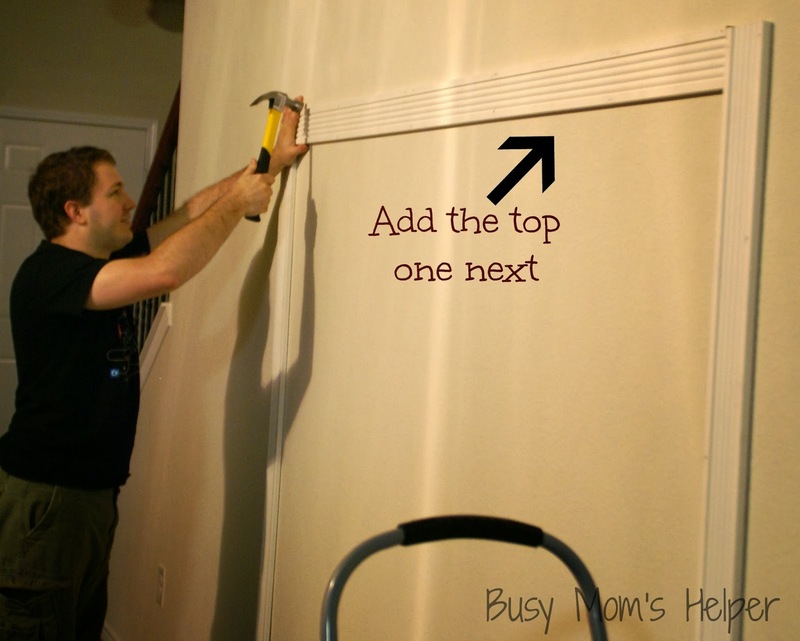 Yes, that’s my hubby being AMAZINGLY helpful – thanks hun! Steps 6 & 7: Add the three divider/separator pieces. Then the middle board. 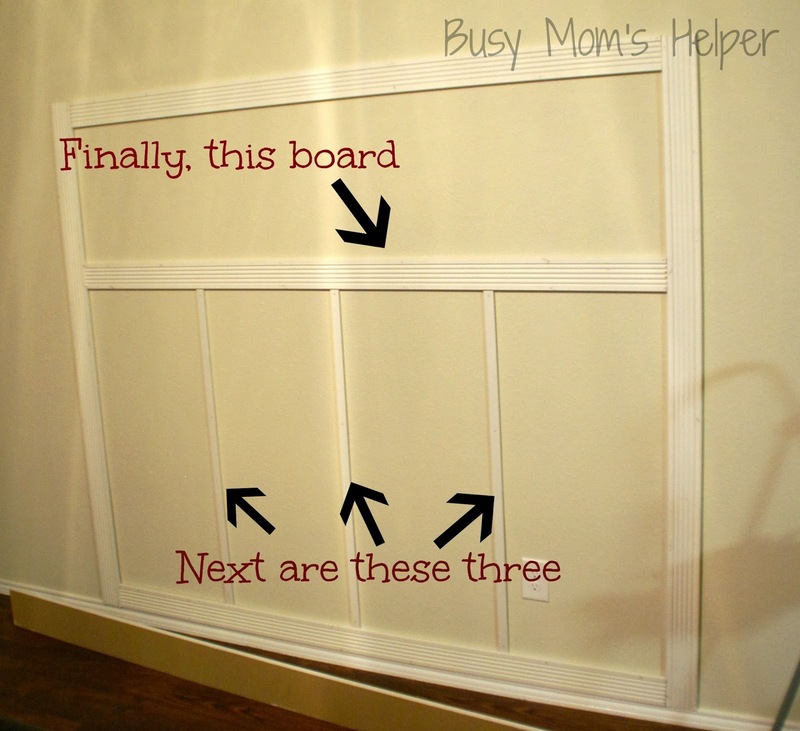 The middle board is where you’ll put the hangers, so try to put a nail through at least a few studs with this board. Also – see how the outlet is really close to one of the pieces – this is one reason measuring is so important! If I hadn’t double checked, we could have really been screwed with that outlet! Step 8: Add the shelf and supporting pieces. We made sure the supporting pieces were in studs, then also nailed from the top of the shelf down into the board below it to help it be more secure. We still can’t put much weight on the shelf, to be safe, but it’s at least secure enough for light stuff or just for show. Make sure you used enough nails. I used white paint for my boards/center, and did them all at the same time after it was built. One of the reasons ours took us so long was that I didn’t plan properly from the beginning, so we ended up making about 5 different trips to Home Depot for supplies – they were so patient with us! Other than that, though, it was actually amazingly fast! I really am glad we used the frames so each kid would have a dry erase board – we can write notes, important reminders for school, or whatever. So excited! What do you guys think of my first big project? 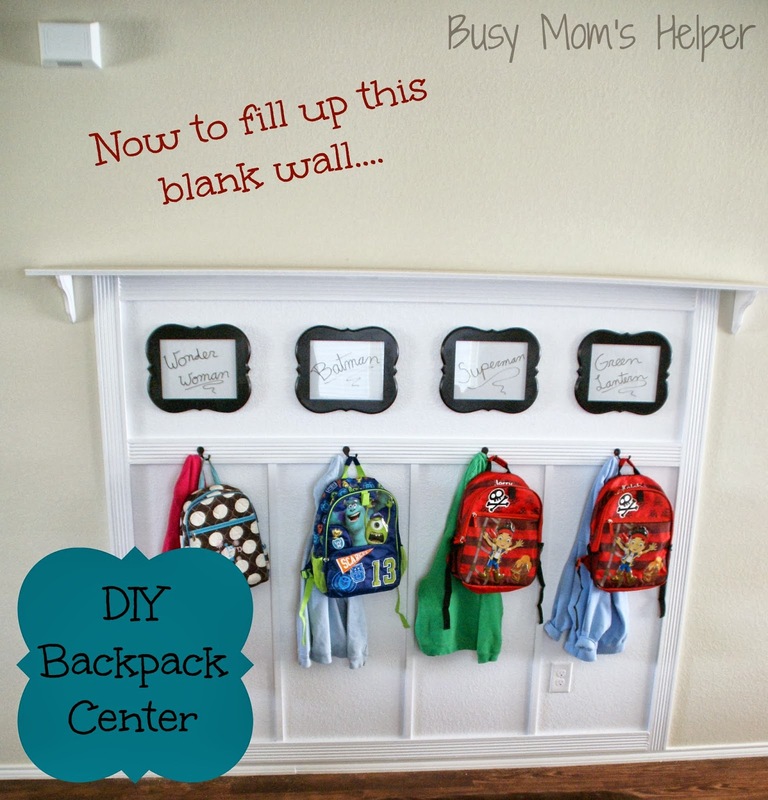 I absolutely LOVE my backpack center, and realized that I really enjoy home remodeling projects, too! So stay tuned….many more fun remodel projects to come!!! 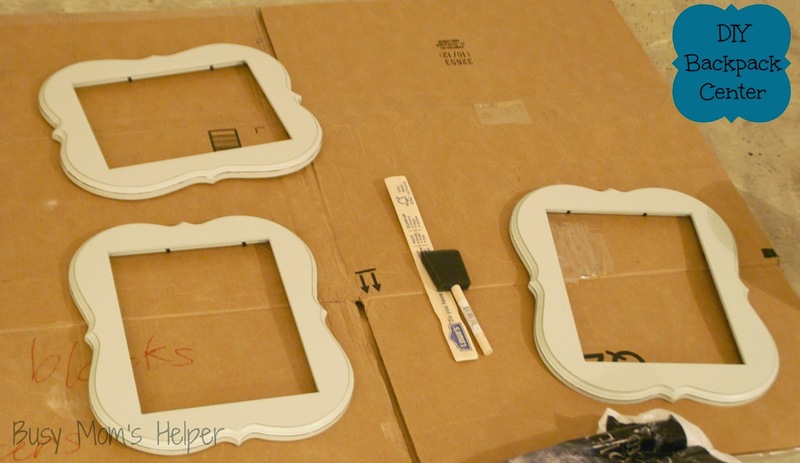 Notes: Yes, I’m sure you can paint the frames last, or in the middle. I just chose to do them first. Notes 2: Going back, I would have gotten 4 cute-designed corner pieces for my corners instead of just having the boards meet. Notes 3: You know how they say measure twice, cut once? Measure LOTS and you still may have to cut multiple times….so be careful and pay extra close attention. Notes 4: USE A LEVELOR to check that everything is straight/level. Notes 5: Use a stud-finder so you can make sure at least some of your boards go into a stud, helping secure your center better. Danielle, this is absolutely perfect! My kids are grown now but oh I hated those days when back packs were laying all over the house or they couldn’t remember where they put them right when it was time to leave for school. Great project and post. thanks for sharing on the Four Seasons Blog Hop! Have a great weekend and look forward to seeing you next week. I know – so frustrating tripping over backpacks, trying to find them in the morning because they left them somewhere random, and oh the piles of jackets – argh! This has been such a nice relief 🙂 Thanks so much for stopping by Terri! Of course I’m pinning this because it’s AWESOME! This is wonderful. 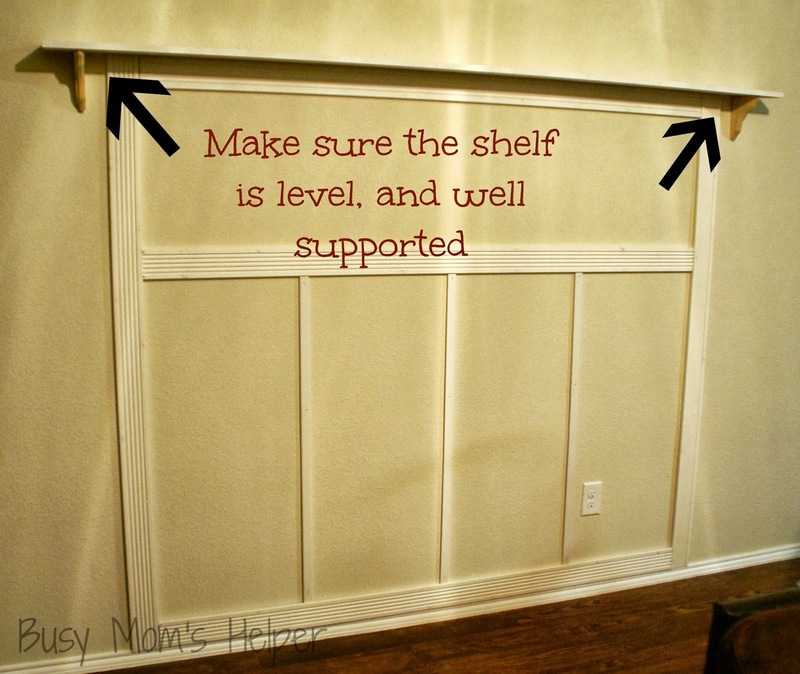 I have a very long wall in my front hall that needs something – this is perfect! It is great for each family member to have a spot, but it is also a great place for guests to hang coats when they come over. PERFECT!!! That’s exactly right – guests need a spot, too. When my mom visited us this past week, she shared the hooks with the kids and it was so nice to just grab her jacket when she walked out the door for something. Thank you so so much for the feature, Allison! It definitely made my day 😀 I hope you’re doing well with the pregnancy – feeling ok? So ready to be done? Hope everything goes well! Danielle, this is terrific! 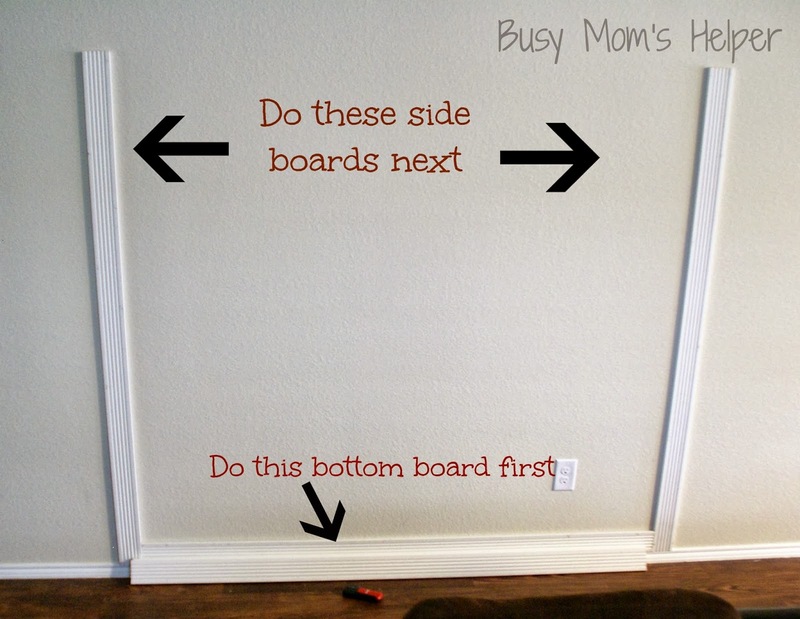 What a great use of that space, and I love the frames where you can leave notes and reminders for the kids. Thanks for sharing! 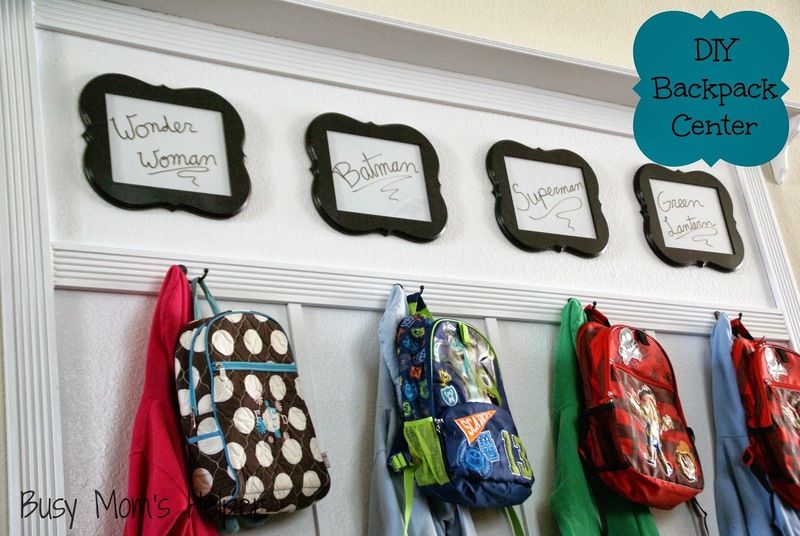 This is such a great idea to keep the whole family organized & it looks so beautiful! Would you mind to link this up to my blog hop? I think my readers would love to see this backpack center. Thanks! Thanks for the invite, Carrie – what a fun party, I love it! I hope your readers enjoy this backpack center – I also shared two of my favorite recent recipes 😀 Hope you have a fabulous week! I love this so much! It looks amazing and so organized! Thanks a bunch, Lisa! Hope your Monday is going fantastic! Great use of space! I love it, so organized and useful…not to mention super cute! Awww, thanks Abby! It’s been such a nice place for putting their school stuff – one of my favorite projects we’ve done so far! Thanks so much for the visit, Carissa! Do you have a dedicated spot for them at your place? I love hearing other people’s ideas! Thanks so so much Cindy! I absolutely LOVE Best of the Weekend – such a fun party with so many great ideas 🙂 Hope your Monday is going fabulous! So very clever and keeps things so tidy. Love the names above each backpack and jacket. Sounds like you have a lot of fun in your family and that your house is fast becoming the home you envision. New follower from Polkadots on Parade. If you have a few minutes come over and visit me. Have a blessed day. Aww, thanks so much Debbie! We do try to have a lot of fun – we try to remind ourselves our kids will be grown before we know it, and I want to have many happy memories 😀 What a fun blog – I LOVE dutch apple pie 😀 Hope you have a marvelous rest of the week!!! It turned out so well – it looks like a piece of built in furniture at first glance! Thank you so so much, Mandy! Such a day-maker to be featured on one of my favorite blogs! Hope the rest of your week is absolutely fabulous! GREAT Tutorial!! Thanks for sharing on DIY Sunday Showcase! I’m gonna pin this to our talent board! And this is my feature pick for this weeks party!! YEAH!! Check the post out Saturday afternoon! Thanks so much Shelly – TOTALLY made my day 😀 Hope you’re having a fantastic Monday, and that the rest of your week is FABULOUS! Great idea and tutorial! I have a space that is just waiting for me to do something like this! I’ll be featuring this on my blog on Saturday! So so cute! What a great idea for the kiddos! You guys did a fantastic job Danielle! Oh thanks so much Tiffany! It was a bit more work than I had planned (thus the measure, measure and re-measure comments above LOL), but it was totally worth it! 😀 Have a fabulous week! This turned out awesome!!! I need to do something VERY similar VERY soon! You did a fantastic job. Thanks for linking it up at Monday Funday. I’m pinning this to the Monday Funday pin board. what a huge difference, that’s awesome! I know, right?! It really helped that blank wall 😀 Thanks so much for stopping by! This is great! Looks fabulous, it’s functional, fun, organized, and helps transfer responsibility to the kiddos! Love it!